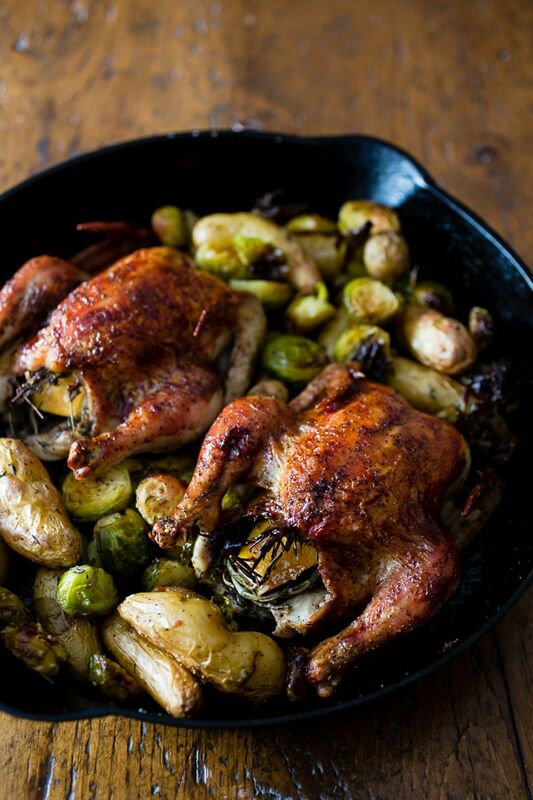 These cranberry bbq sauce cornish hens are perfectly roasted and served with fingerling potatoes and Brussels sprouts. This is one skillet deliciousness! As much as I love Thanksgiving I don’t always love all the planning that comes along with Thanksgiving. There is always so. much. food. And generally not enough people to actually eat all that food. A few years ago my husband was sick and we were unable to make up to his parents house for Thanksgiving. That left my husband and I to fend for ourselves. At that point it was too late to find a small turkey but I did manage to find some Cornish hens. So I roasted them up and made ourselves dinner. It was the perfect Thanksgiving for two dinner. Plus there was no fighting over who got the dark and white meat since we each got our very own hen. It was fantastic. That’s why instead of making a big fat turkey for the blog I decided to share a perfect dinner for two option. This one skillet wonder of a meal cooks everything together and includes all you need for a delicious meal. Crispy roasted Cornish hens glazed with a homemade cranberry bbq sauce (made in the blender!) and served along side fingerling potatoes and brussels sprouts all roasted in the same pan. Since the Cornish hens are glazed with a homemade sauce I simply stuffed them with lemon and herbs. The flavor is subtle and totally perfect for Thanksgiving. Since you’re cooking everything in the same skillet make sure to pick fingerling potatoes that are are not too big. You want them to be able to roast for 55 minutes until they are perfectly soft. Now if you’re still not sold on Cornish hens for Thanksgiving I of course have a delicious herbed mayonnaise roast turkey that would be perfect! BUT if you’re like me and hate large meal cleanup and plan on staying home for Thanksgiving I would say this is the meal for you. You get your poultry, potatoes, cranberry sauce (in BBQ sauce form) and vegetables all in one dish. Do it! 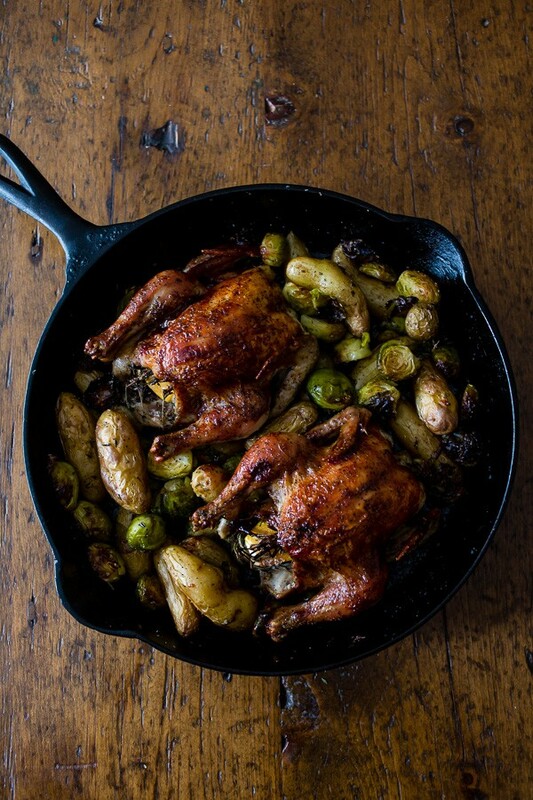 In a 12 inch cast iron skillet add Cornish hens. Season the outside of the hens with desired amount of kosher salt and black pepper. Stuff the hens with 2 pieces of lemon, 3 pieces thyme and 2 pieces rosemary. It doesn't have to be perfect just stuff it into the cavity until it fits. In a small bowl add fingerling potatoes and drizzle with 1 tablespoon olive oil, kosher salt, black pepper. Take the remaining sprig of rosemary and minced the leaves. Add to the potato bowl. Toss to evenly coat and add to pan with the Cornish hens. Add to the oven and roast for about 30 minutes. While the hens are roasting add the Brussels sprouts to the bowl the potatoes were in and drizzle remaining tablespoon of olive oil and season with kosher salt and pepper. Toss to evenly coat. 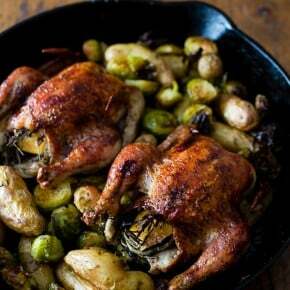 After the 30 minutes of roasting remove the hens and add the Brussels sprouts to the pan with the potatoes and hens. Stir to combine with the potatoes. Glaze the cornish hens with cranberry bbq sauce. Add to a small skillet and simmer for 10 minutes to help combine the flavors. Note: If you buy larger cornish hens you will have to adjust the cooking time. 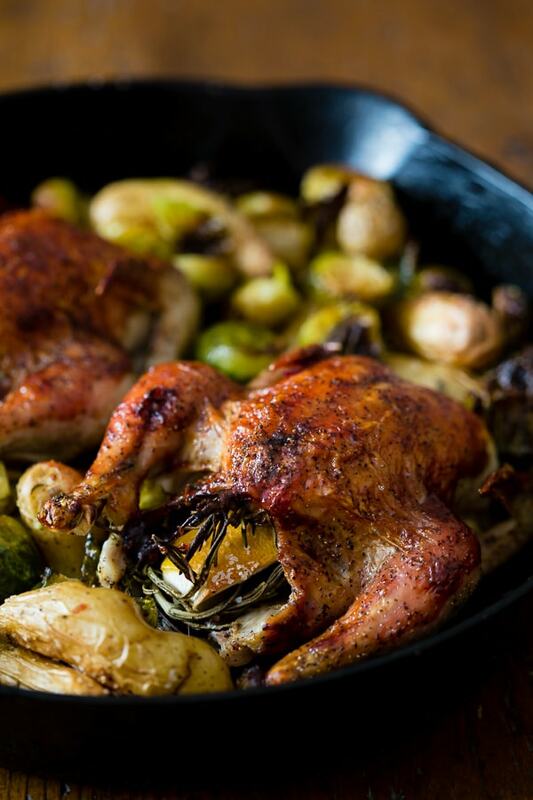 You will want to roast your hens longer and then add in the brussels at the end so they do not overcook. Brandy!!! Oh my goodness I want to shove my face in that pan! We were planning a lazy thanksgiving too until last minute plans for the whole family at our place tomorrow ha! I’ve got to start cooking like….yesterday! I kind of wish it was just us and some cornish game hens. Pinning this! Cornish hens are something I have never cooked but you make it look so easy! I love my cast iron skillet so this is a meal I could totally do! Plus, who does not love fingerling potatoes?! Cornish Game Hens are such an elegant go-to. 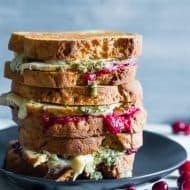 People are always impressed and this recipe looks fantastic! The sauce is wonderful too. That sauce sounds awesome! What a yummy meal! Wow this sounds amazing ….that sauce. I have to try it. What a fantastic recipe, Brandy! Not everyone loves or wants to cook a huge turkey for Thanksgiving and what a wonderful option this is. Cooking it all in one-pan is a huge bonus too. That WHOLE pan has my name on it! We’re covered for Thanksgiving (boo hiss) but I am SO making these for Christmas! We love Cornish Hens at our home, but I forget about them frequently. Now I am craving them! 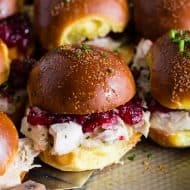 Cornish hens are such a great substitute for a big turkey and these look perfect! So crispy, plus one pan meals are always the best! This is such a great recipe. I showed it to the kids and they were excited that they each got their “own” chickens! I’ve never made cornish hens before but in a few years we are going to be empty nesters and I may not feel like doing a turkey just for my husband and I. Plus you make them look so delicious! This sounds like a great substitute for Thanksgiving dinner! And the photos looks delicious! These cornish hens look phenomenal, Brandy! This is such a perfect alternative to turkey on Thanksgiving! What a fantastic idea for a dinner for two! I wouldn’t limit this one to Thanksgiving though. With those tasty roasted potatoes and Brussels sprouts, I would love this anytime! So we just had a local restaurant start advertising that they were going to be making Cornish hens and I was so super excited and then I came here and saw this and now I’m double excited because I use to LOVE Cornish hens!! I haven’t made them in forever but yum!! I actually would love to have Cornish hens over a Turkey! That’s actually perfect for people that don’t want to cook a huge turkey! This looks delicious, it looks like a restaurant dish, very nice, and easy to do! I love Cornish hens but with a large family, I usually have to settle for bigger birds like turkeys and chickens. Your birds look wonderful. That cranberry bbq sauce sounds amazing. What a fantastic idea for a Thanksgiving for two. I love the flavors you used, and they look delicious! These are freaking gorgeous. I love cornish hens. We used to eat them every Sunday when the kids were little. I could gobble these right up. 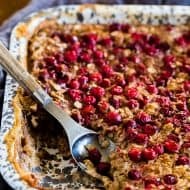 Thanksgiving in a single pan? I am ALL IN! Cornsh hens was a grat idea since your hubby was sick last year. I always go to my moms so we never have left overs for the next day. I’ve learned to cook a turkey and all the fixings the day after. Happy Thanksgiving! so nice… Your birds look wonderful. What a great dinner! So easy and the flavors are awesome!